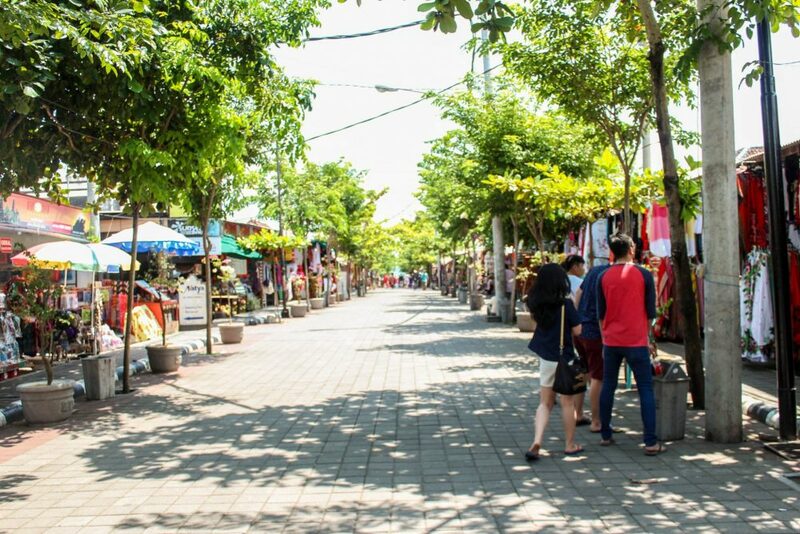 If you are coming from our first post in this Bali series then welcome back! Still in Bali vibe and this in post I will be talking about Balinese nature. 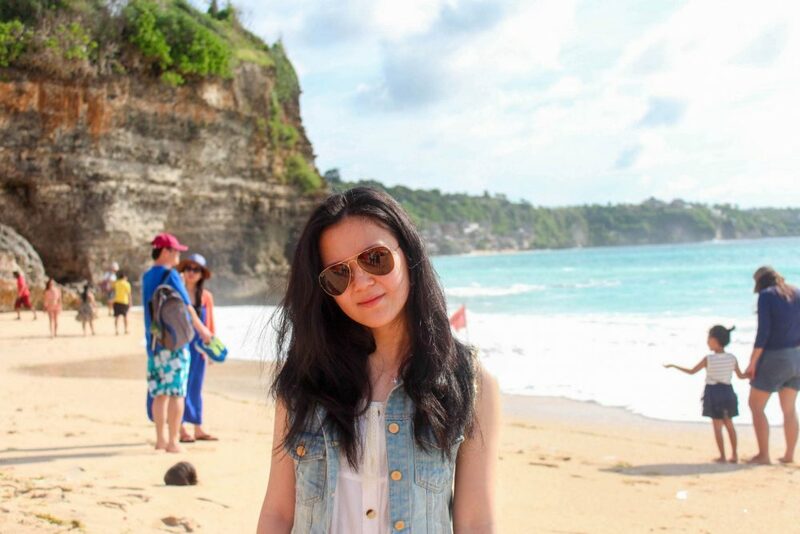 By nature, I mean beaches and sea, half of the reason Bali is famous for. 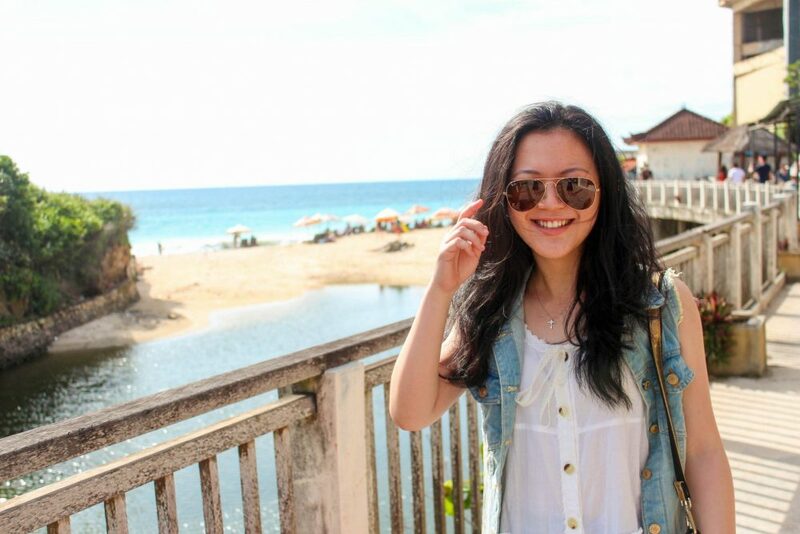 If you only know Kuta beach then you are missing out big time. This island has lots and lots of beautiful beaches. Some of them already become too commercialize like Kuta for example. Those place usually too crowded for my liking. But there are still plenty that less known to people hence made this island the perfect location for beach hopping. And this was the place we manage to squeeze in for our rather lazy itinerary. This was the first beach we dipped our feet into. It is located on the Bukit peninsula, the southern part of the island. 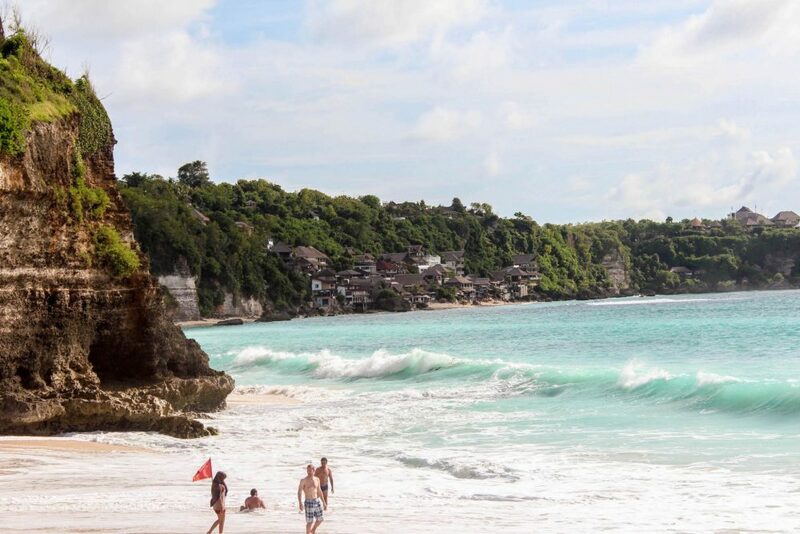 The southwestern part of Bali Island actually famous for its strong wave, surfer favorite. It was pretty far from Kuta, took us 45 mins of a car journey to arrived here. But they do provide a parking spot for anyone who brings a personal vehicle. So we parked our car and paid IDR 15.000 as parking fee. Then we hopped onto the shuttle van that took us to the beach. The shuttle was free and was the only way to get to the beach site. But the shuttle van was poorly maintained. Luckily the shuttle was already there so we barely need to wait at all but they did wait until it was full before taking off. After got off from the shuttle we walked through bridge pathway to the beach. Alongside the pathway were shops that sell souvenirs, swimwear, and snacks. But we only stayed for less than 30mins in the beach as it was soo crowded. Well, it was not super crowded but it was in the middle of the day and it as blazing hot, so none of us intended of swimming. And they do have white sands but NOT the cleanest sea I ever see. We ordered some drinks on the nearby stall, sitting for a bit then went back. It was a bit of a nightmare going back. The shuttle did not actually have any proper schedule or any kind of proper waiting area. So we ended up waiting for almost 20mins for the shuttle. There are mixed reviews about this place. 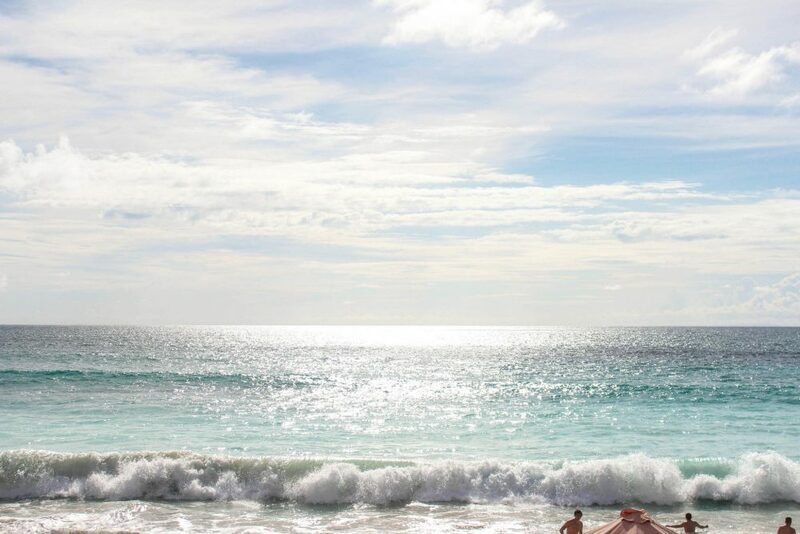 Some of the people said it is the best beach ever but some of them said this place totally not worth your time. They say this place used to be a surfer paradise because of the strong wave. But since the development of resort complex around, it polluted this area with trash and more people. Well for me I don’t dislike it that much but I don’t necessary want to go back here again. This was your typical touristy beach not the hidden gems type of beach. Next one was the Suluban Beach, now this is the hidden type of beach for you all. It was not too far from Dreamland, only 15 mins by car. 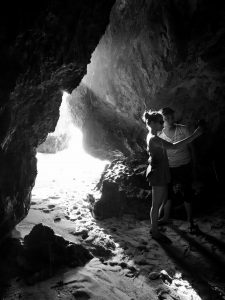 The beach was located down the cliff, literally hidden between the cave. There is no entrance fee for this one. We walked down, more like slowly climbed down the cliff to reach the cave down. The walk was really narrow and steep so it took quite a while for us to get down. Alongside the narrow walk down were lots of shops and small cafes with eating area just beside the cliff. The view looking down was beautiful but if you are afraid of height then this might give you a headache. What keeps people from falling off the cliff is just a piece of rope. Just joking about the falling part, no one ever falls off the cliff but I am not about the safety precaution thing. So focus and keep your eyes on the ground while trying to walk down! The view is nice, right? Down to the beach, I am not sure how people can swim here as it was kinda dangerous. The beach was surrounded by rocks and the wave is strong. But I guess that is why this place is popular for surfers. But it was actually high tide when we were there, so the wave might not be that strong usually. Too bad because of that we can’t really explore the other side of the beach or the caves. The cave was blocked by the wave so we basically got down, took some picture and went up again. If you see lots of my friend’s couple photos, please bear with them they are about to get married after this trip hence the mood. 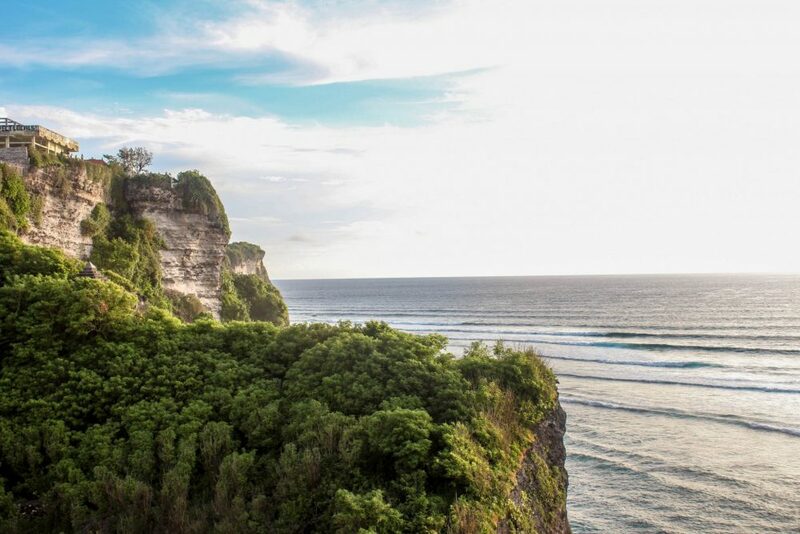 Uluwatu temple is one of the most popular tourist destinations in Bali. The temple itself is not the thing that made this place famous but it was for the monkeys and the view and maybe the wave if you are a surfer. This temple was built on the edge of a cliff overlooking the Indian Ocean and the surrounding is inhabited by a large number of monkeys. These monkeys had made themselves famous due to their habit of snatching visitors belonging. That’s why you will be warned before entering to keep all your smaller belonging like glasses or cameras away. I personally never had any experience having my stuff snatched by those monkeys but I did see someone else being “robbed”, so you do need to watch out for your stuff. Better safe than sorry, right. We paid IDR 20.000 / person for the entrance fee and were briefly warned about the monkey. Because we were wearing short, we were also given Sarung as a cover-up. 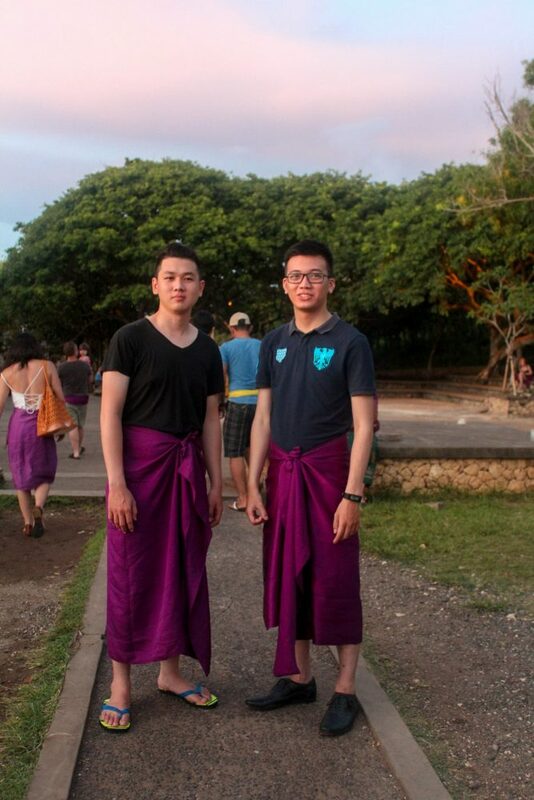 If you don’t know about Sarong / Sarung, it is a large tube or length of fabric worn wrapped around the body and tucked at the waist. The temple area was considered as sacred so no shorts allowed, both women and man. We were on time for the sun just starting to set and it was beautiful. 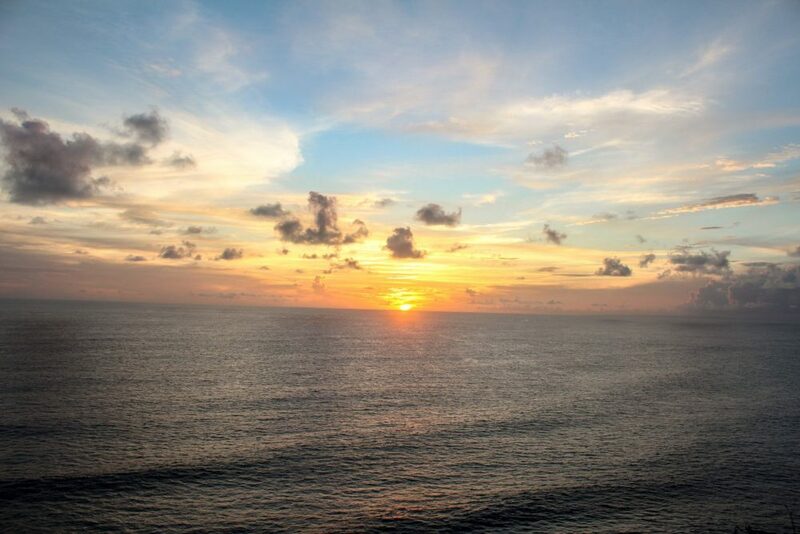 For me, this is one of the best places to see the sunset in Bali. Maybe because this is also their “sacred” area, the feel just different. Imagine seeing orange bias in the vast endless ocean slowly turning into another shade of deeper red and blue. There were also crowds of people watching the sunset, obviously. I saw a huge range of camera being pulled out, from handphone to DSLR. But the most impressive was the surfer guys. Still wearing his surfer suit plus the Sarung around his waist, setting up his gear for the sunset. Thumbs up for the effort, mysterious surfer guy! Oh yeah, this is also the place where you should watch the Kecak Dance. If you don’t know what is Kecak, it is basically a traditional dance and drama which involve fire and music and it’s just mind-blowingly amazing. It’s hard to explain but it’s not only a musical performance, it’s more of a tradition, a spiritual tradition sort of thing. You need to see for yourself. And this place provides you one of the best stage and backgrounds for this performance. They showcase the dance at sunset, so you need to come early to get yourself the best seat, overlooking the sunset. 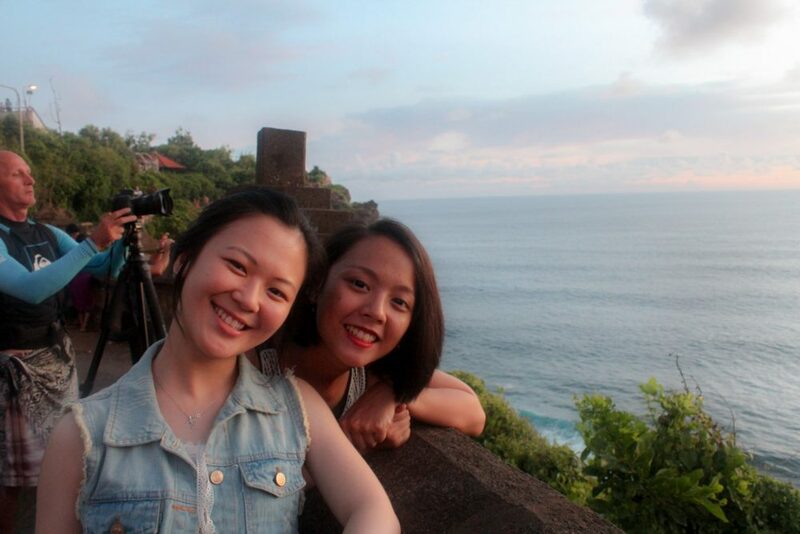 Jumping to the next day and slightly up on the Denpasar area, we also went to Tanah Lot. 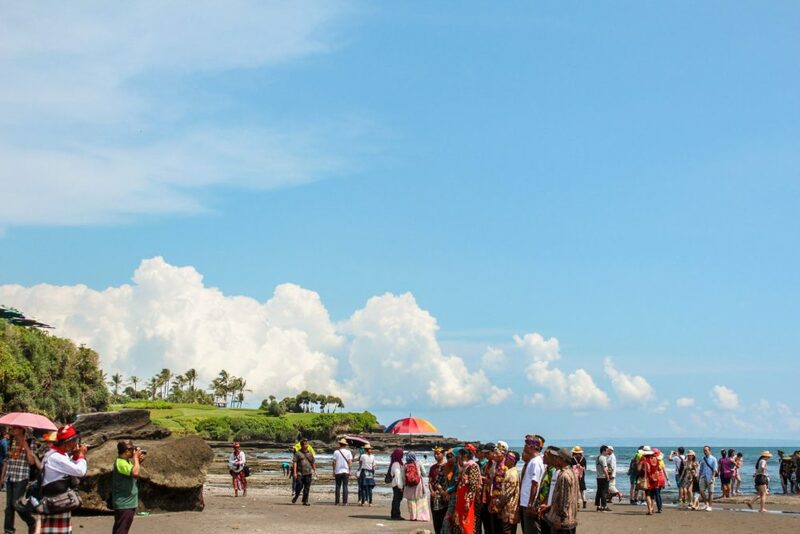 You must have heard of this place, this is one of the most famous tourist destination in Bali. Located 20km northwest or around 45 minutes by car from the Kuta area. Their landmark is the temple perched on the of the rock a few meters offshore. 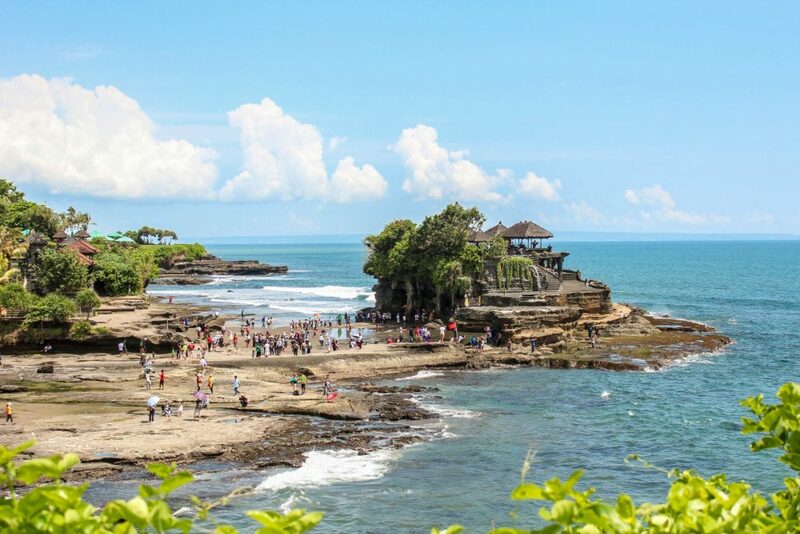 The only way to reach the temple is the rock pathway which only accessible during the low tide, at the high tide the pathway will be fully submerged. When we arrive there it was midday with full on sun blazing right up our head. So after paid for our ticket, which is IDR 30.000 / pax we head out to the nearest mini-market for ice cream. Priority people, priority. Next, we walk down this aisle full of shops which are the only way to the beach/temple area. In this aisle, they sell mostly souvenirs but there were also shops like Roxy or Billabong along the way and also restaurants. We did not actually go inside the temple. We only walked around the base of the rock foundation. On the base of the rock island, there were actually cave with sea snake inside. The Balinese believe that the snake was the guardian of the temple. We can pay to see and touch the snake, they said it bring good luck. My friend did, I did not too fond of the snake so I stayed outside. After that, we walked around a bit because actually, the area was actually pretty big. The have other smaller temple and sort of garden area where you can walk and sit around. And this place is also famous for its sunset tho but unfortunately, I was not staying that long to see the magnificent sunset. That’s all the beach hoping I did that time. If you start to question why there were no swimming in the ocean involve, then worry not. The next part will be about the water activities I did. 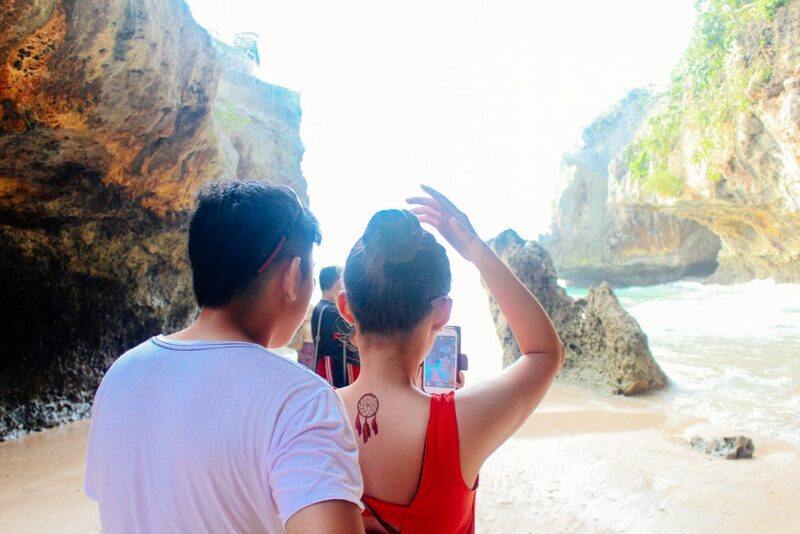 Have you experience beach hopping in Bali? Or maybe anywhere else in the world? Which kind of beach do you prefer, the touristy one or the hidden beach? Comment below 🙂 Until then, thanks for tuning in and see ya! 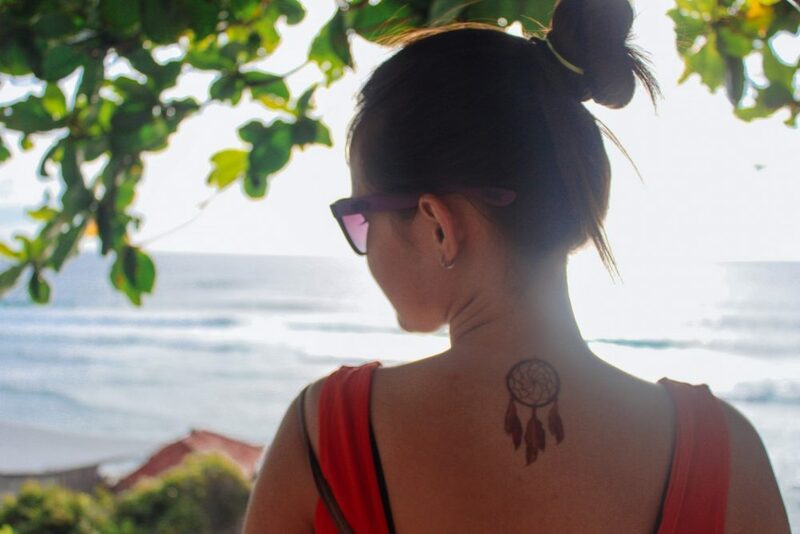 Planning your next holiday to Bali? Check some link below to get yourself some sweet deals! Looking for the best deal to stay in Bali? 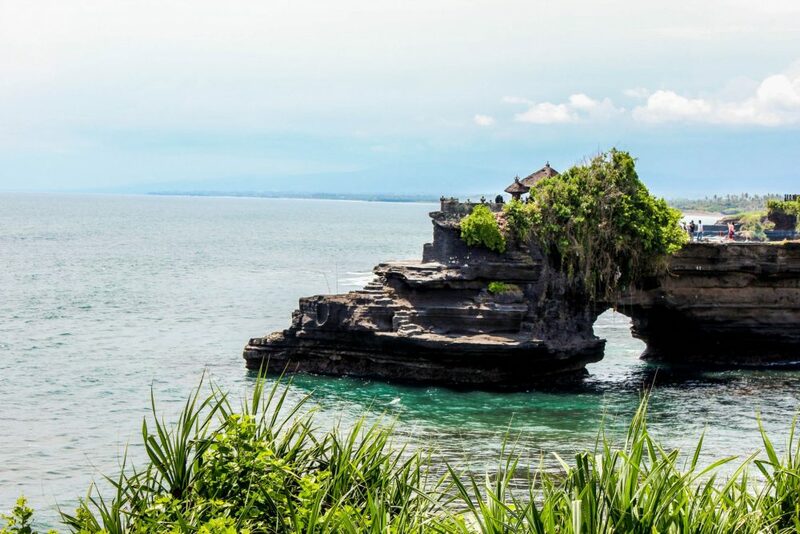 Compare prices and get the best price for flights to Bali. If you have no idea how to get around then just book yourself a private car in Bali.